Don’t wait until your competition out-ranks you, get SEO right now! Really. SEO is an extremely important element for your website. Back in 1994, when there were a handful of websites, SEO was meaningless (doubt if it even existed beyond getting the proper domain name). In 2011, launching a website that is not search engine optimized with clean code, proper tagging, well written, etc, will only mean you are spending money to have a pretty brochure that only the people you give the domain address will see. Its not bad, you can use it in your printed materials to give people more information online. However, most businesses want their websites to be a strong sales tool that gets them prospects and customers. 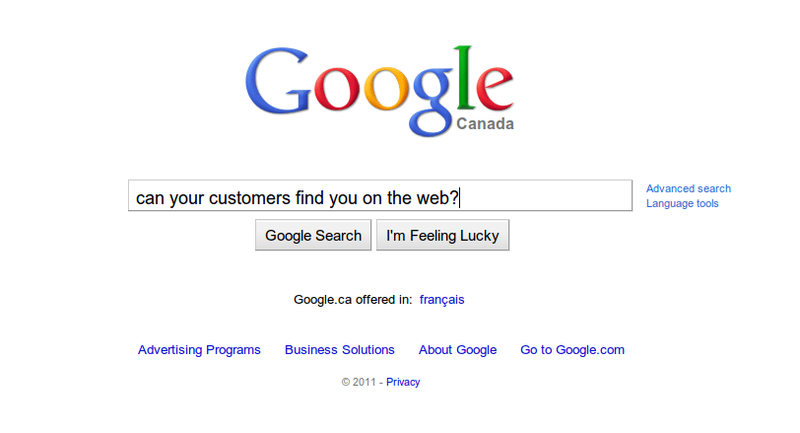 If you want your website to be found online by the people who can buy from you, this shouldn’t even be a question. Search Engines (Google, Bing, Yahoo, etc) use algorithms to determine if a website is relevant to a specific search term. What they are really trying to accomplish is guess what the person wants by reading the search term used. Search Term and Keyword Phrase is what you type in the search field (see image below). When you click Search the Search Engine reviews the database of sites in the servers nearest to you and determines which are the most “relevant” to your term. Relevancy is a big thing for SEO and Search Engines. When a website is “relevant” enough the person searching is happy. If the person is happy, said person uses the search engine more often driving up possible sales of advertising for the SE (Search Engine) and importance. You can attain high relevancy by ensuring the content on your website is readable by the “spiders” or programs that register the information displayed and in code. Flash is a big issue here. Flash is what some designers use to make sites dynamic and animated. Some designers use it for menus and other page elements and this is a problem. Spiders “crawl” your menus and links and find the other pages. If the menus are Flash, then the spider sees it as an image and nothing gets found. Spiders only read text. Google and Adobe (the owners of Flash) have reported working hard on improving readability of Flash content, but it has been years and it still is not very good. So, for the time being, stay away from Flash if what you want is a website that ranks. I do know ways of getting ranked with Flash and have successfully ranked 100% flash websites in the past, however, it is expensive and most of the time, not worth it. Another element is Links. The activity of generating links pointing to your site from other sites is called Linkbuilding. By far the most tedious and time consuming task of SEO. You may find software that does the job automatically, but results are usually very low. The links generated are of poor quality and most are garbage. The best linkbuilding is manually done by an expert SEO (Search Engine Opitimizer). Generally speaking, that is SEO in a nutshell. It sounds rather simple, do I really need to hire someone to do it? In principle, it is simple. However, in each element there are many other little factors that affect the effectiveness of the work. Moreover, doing it wrong can get your site banned from search engines (its happened to some big corporations in the past). A ban in a search engine means you will NEVER be found, no matter what and that is much worse than not doing anything at all. Hiring an expert seo is an investment worth your money. Good optimization will land you on top of the competition and it may even open markets you were not even aware of, resulting in more sales and better business for you. What about hiring a crafty student to do it? It is a risk. If you are lucky he/she will perform a decent SEO job, if you are not, then the student may be a big business risk. Bad SEO can cost you a Google ban or may damage your website and end up costing more to fix it. We normally recommend to at least work with an experienced SEO firm, this will ensure quality and a base level of success. The alternative is to do it yourself. This is the worst case as it will not only cost time and effort, it is as building a second business to try and run your business. Time will be very limited and success will be very difficult. A couple years ago, one of our clients was doing his own SEO, he was working extra hours to try and get his website ranked. His business is a photography business and wanted to rank for terms like Waterloo wedding photography or Guelph wedding photography as many of his clients for wedding photography and boudoir photography are based in those cities. He came to us and our work got him the clients he needed. He is still our client and is now booked a year and a half in advance, his next year is always book solid and continues to grow. Weddings, family photo sessions or even boudoir photography, his business is growing every day. Be weary of newbies and wannabes too. Many people instead of looking for a job, think that web services are rather comfy and try to start a business doing SEO. Stay away, most are experimenting on you and will probably not give you the results you need. Hire professional SEOs with experience, preferably international experience (doing SEO for different countries) as these people would normally know a bit more than local SEOs and have proven experience with Search Engines in many different ways. Also, highly recommended, hire content writing for your website, which is better obtained from the same SEO firm as they will ensure the content is optimized for humans AND search engines.